Agsmart has provided communications platforms for Australian agriculture sectors since we introduced Dairyweb in 2002. Since then we have expanded our offerings into other agriculture sectors. Our services are predominately web based, but now this means traditional website channels, email, SMS and mobile device apps. Our customers include major agribusinesses in dairy, wine, fruit and fodder with planned expansion into other sectors in the future. We are a Melbourne based company which develops custom systems in multiple sectors. While each sector has different needs we have been able to build on the commonality between them - after all, each sector invariably includes processors, growers or farmers, and data flowing between them. This is where we come in. The newest product from Agsmart, FarmSmart is a web and mobile device application for on farm record keeping assisting with QA compliance for dairy farmers. 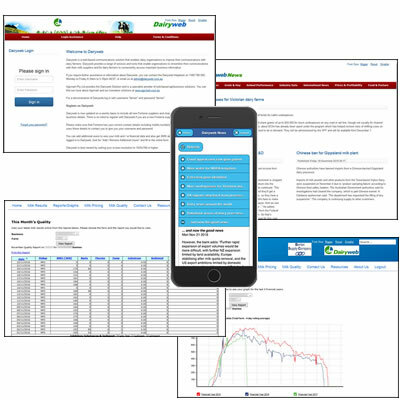 Modules include paddocks, animals, stockfeed, reporting, reminders and notes. It also includes Dairyweb News. After initial setup, FarmSmart can operate effectively regardless of internet connectivity. Data can be synced back to our cloud servers whenever an internet connection is available. 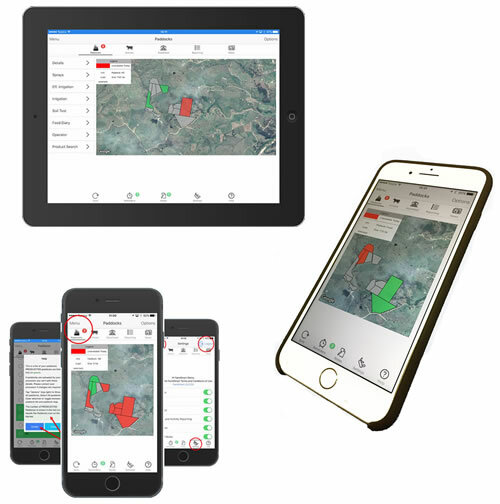 The paddock module is map based, giving farmers an easy tool to use when adding records of various types including chemical applications, paddock grazing rotations, irrigation records and effluent irrigation records. FarmSmart includes a chemical database providing alerts for incorrect usage and withholding periods for grazing. Animal records can also be included in FarmSmart. Again, FarmSmart includes a treatment product database to guide farmers in usage and availability of animals for milk or meat. While FarmSmart does not replace herd recording systems it provides a solid platform for QA reporting about animals. FarmSmart will be developed to provide similar functionality in other agriculture sectors in the future. Our Dairyweb solution has served the Australian dairy industry since 2002. We are the primary electronic communications platform between our milk processor clients and their milk suppliers. At the heart of Dairyweb is our custom built business / farm / user registration system which provides tailored access to farm reports and tools to users of all descriptions. It is up to each farmer if access is required for staff, family, share farmers, bank managers, vets, consultants - anyone who may be interested in either milk production or financial information about each farm. Security of data is a prime concern. Each farm owner controls who sees their on farm information and what information they see. With Dairyweb the milk processor has a cost effective and reliable platform to communicate with milk suppliers. Dairyweb offers multiple communication channels. While the web provides the backbone of Dairyweb we know that farmers may prefer SMS, email of mobile apps to keep track of their farm information. 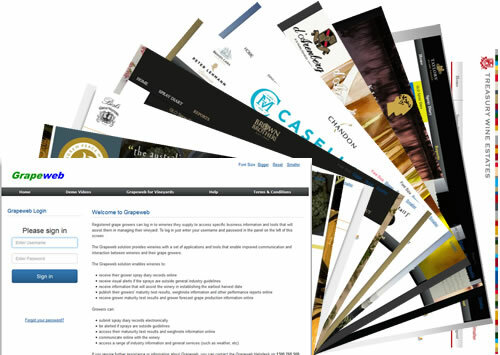 Since entering the Australian wine industry in 2005, Grapeweb has grown to be the default winery to grower communications platform for many Australian wineries, large and small. Grapeweb is now in use by growers accounting for over 50% of hectares under vine for wine in Australia. The key component of Grapeweb is our Spray Diary system. We knew from the start that the spray diary had to be fast, simple to use, easily accessible and feature packed. Data entry is either step by step for most growers or all on one page for growers requiring a more streamlined and feature rich method. The spray diary incorporates a comprehensive database of chemicals in use in Australian vineyards. We manage the products included in the database to ensure it contains products that are actually used and not include products that are not used. The spray diary alerts growers to incorrect usage and calculates earliest harvest dates for wineries to help them with intake. Grapeweb also includes a raft of reports and data entry forms as well as seemless backend system integration for growers and wineries to send and receive vital information. FodderSafe is used in the fodder industry export sector to capture chemical application records on paddocks where the crop is destined for export. This system has been commissioned by the Australian Fodder Industry Association (AFIA) and is available for export growers supplying the major fodder export companies in Australia. The spray diary in FodderSafe is built on the same core functionality as our other spray diary systems in other sectors (winegrapes and dairy) and is supported by a chemical database specific to this sector, providing growers and export staff with information about correct and incorrect usage of chemicals. The system includes application rates, withholding periods and growth stage application restrictions and requirements to guide growers and assist in harvest planning. FodderCare is similar but simpler than FodderSafe and is intended for use in the non export market where overseas restrictions do not apply. FodderSafe / FodderCare will form the basis for similar functionality in the grain sector in the future under the banner Grainweb. © Agsmart Pty Ltd. All Rights Reserved.